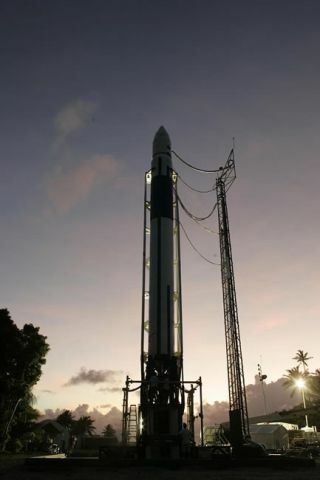 A Falcon 1 rocket - the first to launch for the El Segundo, California-based firm SpaceX - sits atop its launch pad at Kwajalein Atoll near the equator on the Pacific Ocean awaiting its planned liftoff on Nov. 26, 2005. WASHINGTON-- Space Exploration Technologies (SpaceX) now expects the maiden flight of itsFalcon 1 rocket to occur no earlier than Dec. 17, said Elon Musk, the company'sfounder and chief executive. In a Nov. 29telephone interview, Musk said the date is driven by range availability and thetime it will take to have a new supply of liquid oxygen delivered from Hawaiito the company's launch site on the Kwajalein Atoll in the Pacific Ocean'sMarshall Islands chain. Kwajaleinis home to the Ronald Reagan Ballistic Missile Defense Test Site. Musk said theU.S. military has the range booked for missile defense tests between now andDec. 17. El Segundo,Calif.-based SpaceX was forced to scrub a Nov. 26 launch attempt due to anengine computer glitch and liquid-oxygen tank problems. The rocket is slated tolaunch the FalconSat 2 spacecraft built by students at the U.S. Air ForceAcademy. Musk saidthe vent valve on one of the four liquid-oxygen supply tanks used to ready theFalcon 1 for liftoff was mistakenly left open during the fueling process,preventing SpaceX from completing the fueling operation. Inaddition, the rocket's main engine computer reset itself prior to the finalcountdown due to what appears to have been a ground power source interruption,Musk said. SpaceXengineers suspect, but are not yet certain, that ice might have fallen off ofthe Falcon 1's liquid oxygen-filled first stage and struck a quick disconnectbox, temporarily interrupting the flow of power to the computer, Musk said. Hesaid additional analysis is under way to confirm the cause of the problem. SpaceXwould have had sufficient liquid-oxygen supplies on hand at Kwajalein torecover from the tanking mistake if the company's on-site liquid-oxygen planthad not broken down three weeks prior to the launch attempt. SpaceXdecided to ship the needed liquid oxygen in from Hawaii rather than wait forthe equipment to be repaired. But thetanks used to ship the liquid oxygen to Kwajalein were so poorly insulated,Musk said, that by the time the delivery arrived, about 80 percent of SpaceX'sorder had boiled off. Musk saidhe has no choice but to use the same supplier, but this time he is sending twoof SpaceX's own well-insulated tanks back to Hawaii to be filled and shippedback out to Kwajalein. Musk saidhe was working with the U.S. Army to find a ride to Hawaii for the tanks on aC-5 cargo aircraft in the days ahead.